Senate Democrats are coalescing around a plan to block the chamber from taking up any legislation that doesn't address the ongoing partial government shutdown, in a bid to force the GOP majority to allow votes on the House Democrats' push to reopen the government. A key test for the strategy, floated over the weekend by Sen. Chris Van Hollen (D-Md. ), will take place this evening, when senators are scheduled to vote on a motion to end debate on legislation that would impose sanctions on the Syrian government. Minority Leader Chuck Schumer (D-N.Y.) told his caucus he plans to vote against the motion, a senior Senate Democratic aide said yesterday. "Senate Republicans should instead bring to the floor the House-passed bills to reopen the government," the aide said, referencing a six-bill omnibus package passed by the new Democratic House majority last week to reopen agencies that have been closed since Dec. 22 (E&E Daily, Jan. 4). The House separately passed a measure that would continue funding for the Department of Homeland Security until Feb. 8, a delay that is intended to allow more time to negotiate the more than $5 billion President Trump wants for a border wall with Mexico. But Senate Majority Leader Mitch McConnell (R-Ky.) continues to resist bringing up the House-passed bills, which mirror the Senate's own spending bills written last year by the GOP majority. On Friday, he reiterated the chamber will not vote to end the shutdown unless the agreement is backed by the leadership of both parties in the House and Senate, as well as Trump. "My friends across the aisle understand these ground rules perfectly well," McConnell said on the Senate floor. "They know that a solution will need to be palatable to House Democrats and Senate Republicans alike. They know that making laws takes a presidential signature. We all learned that in grade school." But some Senate Republicans, including several who are up for re-election in purple-leaning states, are uncomfortable with the strategy. Sens. Susan Collins (R-Maine) and Cory Gardner (R-Colo.), both in cycle, last week signaled they could support the House plan. Sen. Thom Tillis (R-N.C.), who is also up for re-election in 2020, last week penned an op-ed calling for a comprehensive deal on immigration as a solution to the partial shutdown. It's unclear whether enough Senate Democrats will heed Van Hollen's call to bottle up bills that don't address the shutdown, which he first floated Saturday. "Senate Democrats should block consideration of any bills unrelated to opening the government until Sen. Mitch McConnell and Senate Republicans allow a vote on the bipartisan bills the House passed to open the government," Van Hollen tweeted. "Mitch, don't delay. Let's vote!" Sens. Ben Cardin (D-Md. ), Bernie Sanders (I-Vt.) and Cory Booker (D-N.J.) are among the lawmakers to publicly endorse the strategy. Sen. Jeff Merkley (D-Ore.) also backed the plan yesterday during an appearance on CNN. "I think that's a pretty good idea because this cannot be business as usual if we shut down a quarter of the government and just leave it shut down," he said. "It's an incompetent strategy. It does damage to all kinds of people who are making applications, whether it's benefits for Social Security, or for Medicare or so on and so forth. I mean just all those normal gears of government turning." 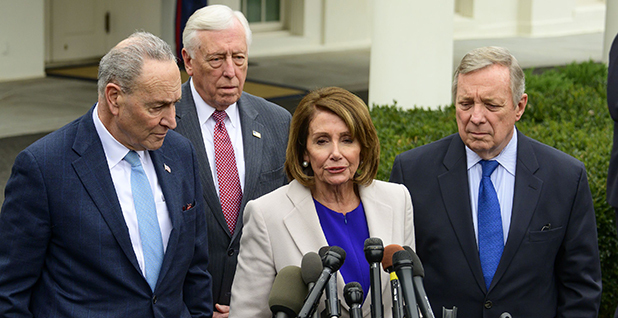 The emerging strategy also comes as House Democrats this week will continue to press bills to end the shutdown, this time individually to emphasize the disruption from the partial shutdown now in its third week (Greenwire, Jan. 7). Those measures include the Financial Services and General Government bill, which funds the IRS, as well as the Interior-Environment, Agriculture, Rural Development, and Food and Drug Administration and the Transportation, Housing and Urban Development proposals. The Trump administration, however, is taking steps to alleviate the impact of the shutdown on the general public, including at the National Park Service, which is tapping unspent visitor fees to help pay for trash collection and the cleaning of bathroom facilities (Greenwire, Jan. 7). And the IRS is taking steps to ensure that tax refunds are paid in the event the shutdown drags on into tax season, Bloomberg News reported yesterday. Such moves could help dampen GOP enthusiasm for Democratic plans to end the shutdown. After speaking yesterday with Treasury Secretary Steven Mnuchin and IRS Commissioner Charles Rettig, House Ways and Means Chairman Richard Neal (D-Mass.) said the administration's plans "are no substitute for funding the government and fully reopening these agencies." House Democrats on Friday also unveiled a $12.4 billion disaster supplemental spending bill to address areas affected by hurricanes, wildfires and other natural disasters. That measure has yet to be scheduled for a vote but could be joined with other spending bills in a bid to end the shutdown. House Republicans did just that before the shutdown began, when they added more than $7 billion in disaster aid to a bill that included the $5 billion Trump wants for his wall. The bill passed the House but was not taken up by the Senate. Meanwhile, Trump tonight will deliver a televised prime-time address on the "humanitarian and national security crisis" along the border with Mexico (E&E News PM, Jan. 7). The president, who is also considering a plan to declare a national emergency in order to bypass Congress to build the wall, will travel to the area later in the week.